Planigale ingrami (Thomas, 1906), Alexandria, Northern Territory, Australia. Length 2.2-2.6 in (55-65 mm). 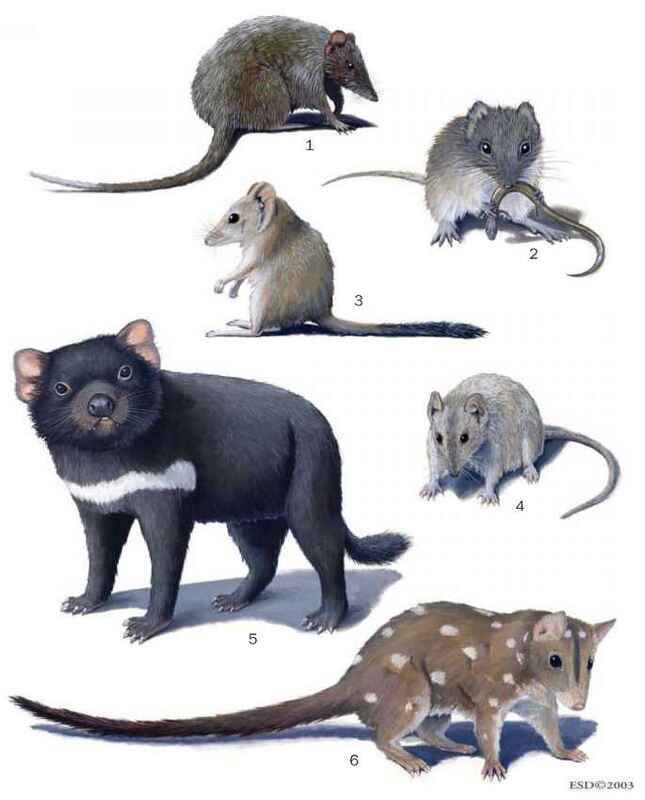 Smallest of the planigales and the smallest marsupial with very flat head and thin tail longer than head and body. Seasonally flooded grasslands and savanna woodlands. Forages and rests in crevices in moist, contracting (cracking) soils, under rocks, and in tussocks. Planigales may have evolved the very flat head to occupy the niche of foraging in seasonally flooded cracking soils. Rapacious appetite; insects, lizards, and even young mammals almost as large as itself. Larger insects are killed by persistent biting. Probably promiscuous. Breeding throughout year but concentrated in late summer. Four to eight young. Lower Risk. Difficult to study on account of minute size. No accurate assessment of populations. Pale pinkish fawn through gray to coppery brown. Underparts creamy or white. Short, dense, and rather coarse hair and longhaired tail. Head and body length 3.0-6.9 in (7.5-17.5 cm), tail length 2.6-6.1 in (6.5-15.5 cm). Typical male 1.7-3.2 oz (48-90 g), female 1.1-1.9 oz (31-55 g). Pale pinkish fawn through gray to coppery brown. Underparts creamy or white. Short, dense and rather coarse hair, short, hooked claws. Head and body length 3.06.9 in (7.5-17.5 cm), tail length 2.6-6.1 in (6.5-15.5 cm). Russet to coppery brown, rough fur. Head and body length 3.5-4.3 in (9-11 cm), tail length 2.2-2.8 in (5.5-7 cm), weight 0.7-1.4 oz (20-40 g). Upperparts predominantly gray or darker brown. Tip and ventral surface of tail are dark brown or black. Head and body length 9.4-13.8 in (24-35 cm), tail length 8.3-12.2 in (21-31 cm). Upperparts grayish or dark brown, white spots or blotches on back and sides. Spots usually extend well onto the tail. Head and body length 15.7-29.9 in (40-76 cm), tail length 19.7-22.0 in (50-56 cm). Upperparts mostly grayish, or olive brown to dark rufous brown, underparts paler yellowish or white. Prominent white spots or blotches on back and sides. Head and body length 13.8-17.7 in (35-45 cm), tail length 8.3-11.8 in (21-30 cm). Upperparts grayish or olive brown to dark rufous brown. Coat is coarse with little underfur. Head and body length 9.4-13.8 in (24-35 cm), tail length 8.3-12.2 in (21-31 cm). Dull grayish brown upperparts, white underparts, long, sparsely haired tail, few long hairs at tip. Head and body length 4.1-11.2 in (10.5-28.5 cm) and tail length 5.7-9.4 in (14.5-24 cm). Dark, grayish brown upperparts. Broad, black dorsal stripe is present. Underparts are light brown, fur is short and dense. Head and body length 4.1-11.2 in (10.5-28.5 cm), tail length 5.7-9.4 in (14.5-24 cm). Found mostly in dense, moist forest. Monestrous, breeding pattern of three months followed by a synchronized male die-off. One litter produced per year. Found in wide variety of forest and brushland habitat with sufficient cover. Very active, climbs well. Monestrous, three month breeding period, one litter produced per year. Found in spinifex grassland. Mating occurs in September, followed by synchronized male die-off. Southeast Queensland, east New South Wales, east and southeast Victoria, coastal southeast Australia, and Tasmania. Cape York Peninsula (Queensland) to Victoria and southeast South Australia, southwest Western Australia. Mostly invertebrates the size of small insects to domestic sparrows, but can supplement diet with fruit, such as blackberries. Pilbara region of northwestern Western Australia. Near Threatened a year. Cats maintained in pairs except when female has young. land, and north Western Australia. Found in dry forest and open Australia, in east rock rats, common rock rats, and sandstone antechinus, as well as reptiles, worms, ants, termites, grasshoppers, beetles, figs, and other soft fruits. Queensland, east New South Wales, east and south Victoria, southeast South Australia, and Tasmania. Formerly found in South Australia. Probably survives only in Tasmania; formerly South Australia, New South Wales, and Victoria. country. Nocturnal hunter. Lengthy courtship. Mones-trous, winter breeders, six to eight young produced per year. Variety of habitats, including rainforest, heathland, alpine areas, and scrub. Prefers dry grassland, forest mosaics bounded by agricultural land, drier forest, and open country. Shelters in rock piles or hollow logs. Five to six young per litter. Maximum known lifespan is six years, ten months. Found in dense, moist forest New Guinea. Primarily terrestrial, can climb well, nocturnal. will also eat vegetable matter. May consume mammals as large as wallabies. Predatory animal, but will also consume vegetable matter. Insects and rodents also compose diet. Found in all lowland and midmountain forests of New Guinea, from sea level to 6,230 ft (1,900 m). Known from only eight specimens, this species has an altitudinal range of 3,2806,560 ft (1,000-2,000 m). Presumed to be insectivorous and carnivorous. Upperparts richly variegated chestnut mixed with black and yellow, head is dark rusty red. Most colorful of all marsupials Long tapered tail and slender snout. Head and body length 6.7-9.8 in (17-25 cm), tail length 5.9-9.1 in (15-23 cm). Upperparts dark brown to black, under-parts usually yellowish, sides of face salmon to brown. Thin tail. Length known only from two young samples: head and body length 1.9-2.1 in (4.9-5.3 cm), tail length 1.9-2.0 in (4.8-5 cm). Upperparts grizzled brown, underparts pale gray, cinnamon patches behind large ears. Head and body length 2.2-3.9 in (5.7-10 cm), tail length 3.2-4.5 in (8.2-11.5 cm), and weight 0.42-1.6 oz (12-44 g). Tail is long and thin. Grayish upper parts, white underparts. Head and body length 3.7-4.8 in (9.3-12.2 cm), tail length 4.7-1.8 in (11.9-4.5 cm), and weight 1.3-2.4 oz (38-68 g). Rear half covered by long, silky, black hairs. Grizzled gray-brown coloration with chestnut red underneath. Head and body length 2.6-5.3 in (6.7-13.4 cm), tail length 2.4-4.3 in (6-11 cm). Thin black stripe runs from head to tail. Upperparts pale tawny olive, darker tawny, or brownish gray; underside olive buff, fuscous, or light tan. Head and body length 2.0-3.9 in (5-10 cm), tail length 1.8-3.5 in (4.5-9 cm), average weight 0.54 oz (15.3 g) for males, 0.38 oz (10.9 g) for females. Upperparts pale tawny olive, darker tawny, or brownish gray, underparts are olive buff, fuscous, or light tan. Head and body length 2.0-3.9 in (5-10 cm), tail length 1.8-3.5 in (4.5-9 mm), weight 0.18 oz (5 g). Upperparts are grayish brown, chestnut patches behind ears, underparts are grayish white. Head and body length 3.7-4.1 in (9.5-10.5 cm), tail length 3.0-3.3 in (7.5-8.5 cm), and weight 0.71-1.6 oz (20-45 g). Soft, fine, dense fur, buffy to grayish in color, underparts are white or grayish white. Feet usually white, tail is brownish or grayish. Some species have a median facial stripe. Head and body length 3.3 in (8.3 cm), weight 0.35-0.53 oz (10-15 g). Occurs in most rainforests of the lowland and mid-mountains of New Guinea. Nocturnal and scansorial in habit. Found in dry grassland and savanna, mainly under dry conditions. Nocturnal. Uses dry, raspy sound to communicate. Found in rugged, rocky country covered with eucalyptus forest, perennial grasses. Mating occurs late June to early July, four to five young constitute a litter. Found in heavy, humid forest and more sparsely timbered arid regions. Nests consist of leaves and twigs in the forks or holes of trees, some are built on ground. Nocturnal. New Guinea; Salawati Island and Aru Islands (Indonesia). Australia, in Western Australia to New South Wales and Victoria. Plants and insects, mainly ants and termites. Occur In mountain forests at high altitudes from 3,970 to 10,170 ft (1,210-3,100 m). Nocturnal and scansorial (climbing) in habit. Can be found in savanna woodland and grassland, and reportedly in rainforests. Shelter consists of rocky areas, clumps of grass, bases of trees, or hollow logs. Nests are saucer-shaped, composed of dry grass. Most nocturnal, primarily terrestrial. Can be found mainly in savanna woodland and grassland. Seemingly nocturnal, but active throughout periods of the day. Avid predator. Can be found mainly on rocky hills, breakaways and in termite mounds. Predominantly nocturnal. Females produce one litter annually. Mating occurs in winter and spring. Can be found mainly in dry country, but sometimes in moist areas. Dig burrows or construct nest of grasses and leaves. Mainly terrestrial, but some are agile climbers. Nocturnal. East Queensland, northeast New South Wales, and north Northern Territory, Australia. Inland southwest Western Australia, formerly in Northern Territory. South Australia, northwest Victoria, southwest New South Wales. Most likely extinct, except in Western Australia wheat belt. West and east interior of New Guinea. Small mammals, birds, lizards, and insects. Insects, spiders, and small mammals. Northeast South Australia, northwest New South Wales, and southwest Queensland, Australia. North Western Australia, Northern Territory, and central deserts in Australia. South Australia, southwest Queensland, southeast Northern Territory, south Western Australia, west New South Wales, and west Victoria. Insects, spiders, small lizards, and small mammals. Mainly insectivorous, but also eats small vertebrates, such as lizards and mice. and tail length 2.2-5.1 in (5.5-13 cm). accumulates fat when food is scarce.